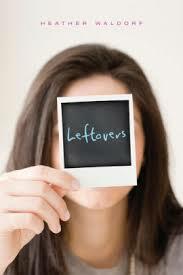 In the title of this heartfelt and humor-filled story, Heather Waldorf expresses the irony inherent in the idea of leftovers – those ‘un-included’ things and people that can pleasantly surprise. Fifteen-year-old Sarah Greene has, ironically, felt greatly relieved by the death of her father, but she still has to deal with his ‘leftovers’. When she reacts by flouting the law, she find herself at a summer camp, sentenced to do community service caring for shelter dogs as a modest warning by the court. The experience turns out to be full of surprises. She is assigned to care for a big, rowdy dog named Judy and to take over the kitchen. She becomes friends with the not-very-hip Sullivan. The work and the friendship help her discover her talents and come to terms with the effects of her father’s behaviour on her and her life. Without being sentimental or judgmental, Waldorf manages to construct a compelling account of an adolescent struggling to find herself. It is beautifully written, a page-turner.